WASHINGTON – Catholic charitable organizations are stepping up to help victims in the Philippines after the worst flood in decades hit in late September. Picard told Catholic News Service in a Sept. 28 telephone interview that rescuers were still searching for survivors from the flooding and mudslides two days earlier. The flooding followed Typhoon Ketsana, or Ondoy, as it was referred to in the Philippnes. “With the water now touching the roof and the rain still slashing with 50-mile-per-hour winds, they were afraid of being washed away,” Caufield said. In order to survive, his wife’s family created a raft out of a rope and bamboo poles to get to a neighbor’s house, which was located on higher ground, he said. Picard told CNS that after the storm approximately 100,000 families were sheltered in temporary housing, elementary schools and churches. While some families will be able to go back home soon, others have lost everything, he said. In a statement, CRS said it was providing immediate food aid, blankets, mosquito nets, sleeping mats and soap, among other basic necessities. “With CRS’ initial funding, we’re helping 5,000 families through Caritas. All the food and other items being distributed are getting to people via Caritas,” Laura Sheahen, CRS regional information officer based in Cambodia, told CNS by e-mail. Caritas is the umbrella organization of Catholic aid agencies. In a statement, the Caritas office in the Philippines said it was providing aid to a total of 10,000 families, or 50,000 people. The equivalent of a month’s worth of rain fell in six hours and, at one point, more than 80 percent of Manila was under water. Impassable roads made rescue efforts challenging, and power and water supplies failed in some areas. The government declared a “state of calamity” in Manila and 23 provinces. Metropolitan Manila was the worst-hit in terms of flooding and damage, while Rizal had the highest number of casualties due to landslides and flash floods, said Caritas Philippines. 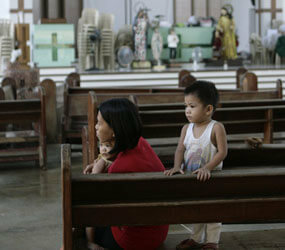 In the province of Pampanga, more than 200 villages were submerged. A landslide occurred in Arayat, affecting 174 families, who were temporarily housed in five evacuation centers, mostly schools and chapels, said Caritas Philippines.